@A_Bigalke @SkyFootball it's not a problem, he is come to be replace of Batshuayi. Thank's to you. That could be translated to back up or sub for Batshuayi which would explain the tone. The French don't really do Sarcasm. L'Equipe now reporting that Marseille have signed Steven Fletcher from Sunderland. Batshuayi in play? Correction: it's a 5-month loan deal. 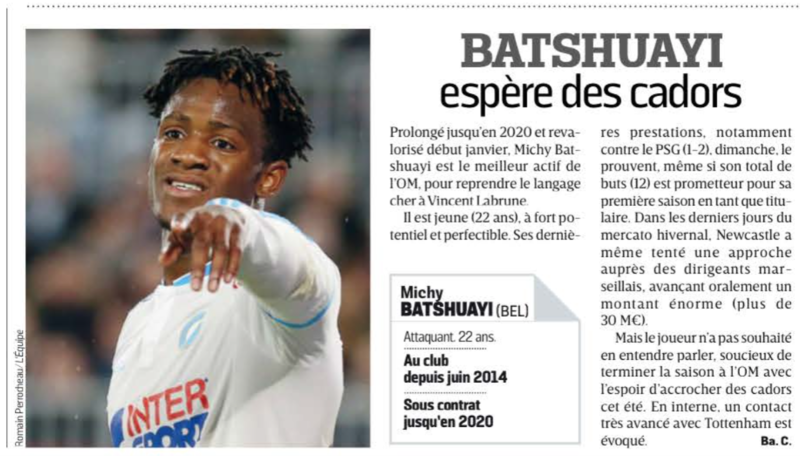 Thursday, L'Équipe reports on the future of Michy Batshuayi . Thus, in recent weeks, Vincent Labrune was very busy for a young striker. Newcastle had referred in particular an offer of 30 million euros. Nevertheless, the question for the Belgian from the OM during the season, but a start could finally be topical this summer. Thus, according to sports daily, Batshuayi hopes to tap into the eye of bigger clubs and take the next step in his career. With Tottenham, contacts are also well underway. Not sure how 'advanced', but would love it if there's substance here. There are 2 reports that are saying we are in advanced talks over signing Batshuayi in the summer. I'm not posting the links cos I got such a kicking over my last posting. Look on the official site under Media Watch and you'll find them. Wouldn't it be fantastic if we completed the signing of a highly coveted number 9 before the Euro's even started. Just like the Modric transfer, but in the position we always find difficult to sign. Shame it's the Metro which makes the Sun seem like gospel. It's l'equipe reporting we are in advanced talks. Metro are just recycling the story. Batshuayi is not a Belgium regular. Lukaku is certainly ahead of him in pecking order & is firing goals in for the club. I can't see Batshuayi getting minutes unless there are injuries. Its currently a very remote chance that his stock would rise after Euros, given the competition ahead of him. Yeah, good point. L'equipe have always been pretty clued up on French transfers iirc? Hope it's more than just a rumour. He'd be an ideal partner for Kane, a freakish athletic striker, who will be able to create more space for Harry and Eriksen. And he can handle himself as a lone striker as well. I'm one of those, who have been pining for him since he was at Liege, so it would be great to finally get my man in a round about way. Here's the image grabbed from the article which isn't on their website but is only in the L'Equipe printed magazine type thing. Just need somebody who can translate. I'm tenting at the thought of him joining in the summer!